JAKIM PUMPS Manufacturers of Hydraulically Operated Diaphragm Type Metering / Dosing pump for suitable service conditions involving hazardous toxic, radioactive or poisonous liquid where product leakage is not at all permitted. The Diaphragm is hydraulically actuated and has a long life as it is always in hydraulic balance, with the liquids being pumped on one side and actuating fluid on the opposite side. Its function is basically that of a partition. The diaphragm material is usually Teflon. The system is safety guarded by a in built Relief Vacuum Combancity Valve on the hydraulic side. For very severe duty conditions or when handling slurry or hot liquids, double diaphragm and remote heads can be provided. The Range includes high precision positive displacement pump conforming to API 675. Typical applications for our pumps are useful for accurate dosing and mixing of acids, alcoholics, slurries, viscous liquids etc. Our range covers everything from the single pump to a completed automated Metering dosing system and comprises of plunger and diaphragm pump with metering range from various capacity and pressure from 2 – 15000 LPH. 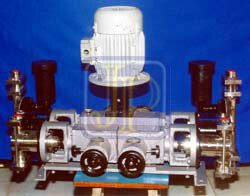 pump can be offered in Simplex, Duplex, Triplex and Multiple Heads, handling for different chemicals with a common Motor. Each head would have independent connection and capacity of each head can be also independently adjustable. The pump discharge is variable while pump is running or at rest from Zero (0%) to full stroke (100%) by means of a precision machined Crank equipped with a stroke length adjustment mechanism. The Stroke of the pump controlled either Manually Wetted parts can be offered in S.S. 316 or 304, Carbon Steel, P.P. / Teflon / PVDF, Alloy 20, Hastalloy B or C. etc. Diaphragm Type Pumps are used in Chemicals Plant, Fertilizer Plant, Water Treatment Plant, Soap Plant, Paper Industries, Pharmaceuticals Industries, Thermal Power Projects, and Plastic Industries.